Lumbar spinal stenosis is a narrowing of the spinal canal that compresses the nerves traveling through the lower back into the legs. While it may affect younger patients due to developmental causes, it is more often a degenerative condition that affects people age 60 and older. About 400,000 Americans, most over the age of 60, may be suffering from the symptoms of lumbar spinal stenosis, according to the American Association of Neurological Surgeons. Arthritis is the degeneration of any joint in the body. Osteoarthritis is the most common form of arthritis, and often results from wear and tear of aging joints. Degeneration is loss of cartilage that results in inflammation and bone spurs. In the spine, arthritis can result as the disc degenerates and loses water content. This causes settling of the disc spaces and loss of disc space height. As the spine settles, two things occur: First, weight is transferred to the facet joints behind the spinal cord. Second, the tunnels through which the nerves exit become smaller. As the facet joints experience increased pressure, they begin to degenerate and develop arthritis. Bone spurs form, which may also narrow the space for the nerves. Additionally, ligaments around the facet joints increase in size, decreasing the space for the nerves. Once the space has decreased sufficiently, irritation of the nerves occurs resulting in symptoms. Loss of space around the nerves in the spine is termed spinal stenosis. Initially, compression of the lumbar spinal nerves can result in pain in the areas that the nerves supply, usually described as an ache or a burning feeling. It typically starts around the buttocks and radiates down the leg. As it progresses, it can result in pain in the feet. As compression increases, the burning pain will be associated with numbness and tingling. Not all patients will have both pain and numbness and tingling. The pain down the leg is often called sciatica. Once the compression has reached a critical level, weakness can occur in one or both legs. Some patients will have a foot-drop, or the feeling that their foot slaps the ground while walking. 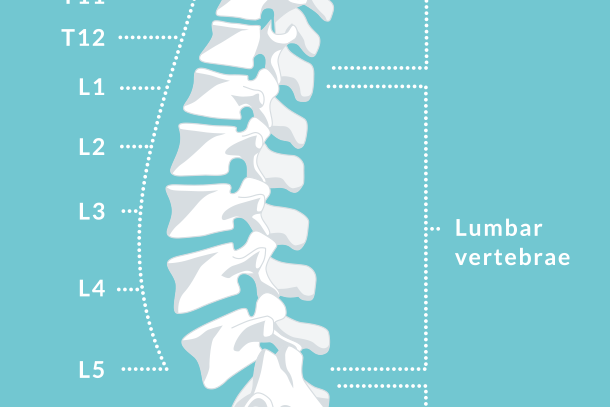 Lumbar spinal stenosis may be diagnosed using a personal history and physical examination. Your physician will start by ordering X-rays of the lumbar spine. X-rays only show the bones of the spine. On the X-ray, loss of height of the disc spaces or bone spurs will be noted. You will be asked to lean forward and backward during the X-ray to diagnose instability of the joints in the spine. After your doctor reviews the X-rays, he or she may order a magnetic resonance image (MRI) scan of your back. This will show the nerves and spinal cord. Nonsurgical treatment of spinal stenosis focuses on restoring function and minimizing pain. Physical therapy, including stretching exercises, massage, and abdominal muscle strengthening, improve symptoms for many patients. Additionally, lumbar traction may be helpful in some patients. In addition, the use of nonsteroidal anti-inflammatory (NSAIDs) medications may improve symptoms. Examples of NSAIDS include ibuprophen and naproxen. These medications relieve pain, and when used over the course of 5 to 10 days, they have an anti-inflammatory effect. Because pain is caused by a decrease in space around the nerves, the decrease in inflammation (swelling) around the nerve can be very effective in relieving pain due to lumbar spinal stenosis. Medications must be used carefully because they can be associated with gastritis or stomach ulcers. If you develop acid reflux or stomach pains while taking an anti-inflammatory, be sure to consult with your doctor. In addition to medication, use of cortisone (a potent anti-inflammatory) injections can be very helpful. Cortisone injection can decrease the inflammation around the spinal nerves as well as pain. Surgical treatment of lumbar spinal stenosis is generally reserved for patients who have a poor quality of life due to pain and/or weakness. Patients who complain of inability to walk more than one or two blocks, a foot drop and numbness and tingling may be candidates for surgical treatment. Treatment can include removal of the bone and bone spurs that compress the nerves (laminectomy). Open surgery and minimally invasive options are available. If the spinal arthritis has progressed to result in instability, decompression and fusion may be recommended. Both options can result in significant pain relief. Be sure to discuss the advantages and disadvantages of both with your doctor.